Host Sylvia Richardson speaks to Venezuelan-Canadian Sociologist Maria Paez Victor who defines the conflict in Venezuela as a neocolonial war. 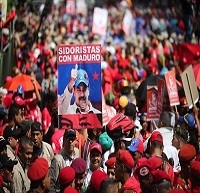 In this interview we explore the historical revolutionary process of Venezuela of the past 20 years as the people rose up against the IMF and World bank’s structural adjustments and brought to life the Bolivarian revolution that elected Hugo Chavez to power and later elect Nicolas Maduro. What is at stake is the return to colonial warfare as way to strip Latin Americans of their independence and autonomy to choose their own governments while rejecting being colonies for resource expropriation by USA and European corporate interests. This entry was posted in Uncategorized and tagged be the media, bloggers, borders, capitalism, Common Frontiers, community, dispatches, Flesh Mapping, global news, Honduras, how to listen, international, internet, interviews, itunes, Latin America, latin waves media, Maria Páez Victor, media, media democracy, membership, Michael Albert, movements, nother world is possible, participatory economy, passion, Peace, Podcasting, political, politics, radio, Revolution, social change, sound, Stuart Richardson, Sylvia Richardson, Venezuela. Bookmark the permalink.